Sunday morning saw me on the road early heading for Halifax and the latest round of the Northern League 450 point doubles competition. I could tell it was going to be one of those days right from the start. Believe me it was. I apologise in advance for a longer post than usual. I’d never been to the Halifax club before and this proved to be a problem: Halifax town centre looked nothing like the maps I’d downloaded. Luckily, I spotted a large flyover which I hoped was the one on my map and headed for the nearest garage. The guy in the garage hadn’t a clue but the large lady sitting on the wall outside the garage enjoying a cup of tea did. Within 5 minutes, and well before 9:00 am, I was outside the Social Club car park. The competition was due to start at 09:30 am so I thought I’d have lots of time to get ready for the first game. The car park was full of people as the club wasn’t open yet. I thought my luck was changing when, just as I parked up, someone opened the door but it hadn’t. The Halifax club keep their table tops locked away but no one had a key. The competition eventually started at 10:15 am and I could have stayed in bed an extra hour. 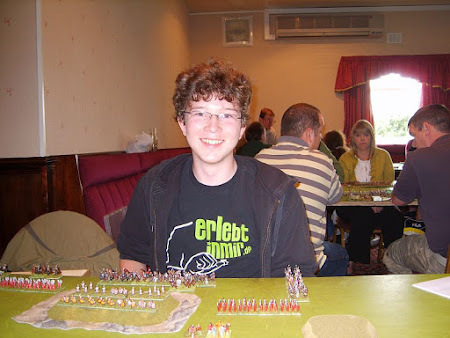 Both Graham, my regular opponent, and I had planned to play singles and we had both brought armies. For the second time this year we were prevailed upon to double up because of a shortage of tables. This wasn’t too bad as we’d been given advance notice that this might happen by the organisers but it wasn’t ideal. I was looking forward to using my Later Poles with an inert C-in-C and a brilliant Lithuanian sub-general. It’s fair to say that Graham wasn’t. For readers who don’t play DBMM, using an Inert C-in-C means that all command dice rolls are reduced by 1. So if you roll 1 the command does nothing and you need to roll at least 3 to carry out one complex move. On the plus side, all the Irregular Knights and Bd (F) in the Polish army are easier to control because they are no longer impetuous. Finally, Inert armies are bigger and harder to break. Anyway we prepared for the first game. 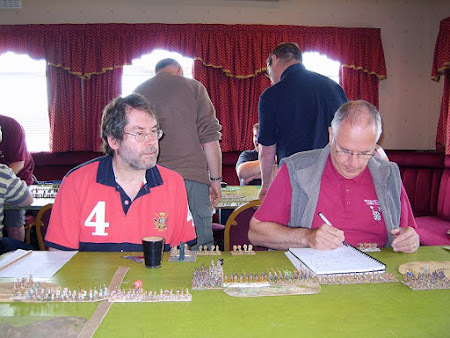 We were drawn against Thom Richardson and Keith Nathan’s Arabo-Aramaean on a very wonky table. Job one was finding some extra support for the table top. After a tough struggle we lost 29-3 with all of Keith & Thom’s four commands one element away from breaking. The key factor in breaking the Poles was the 4 temporary ME penalty for breaking two commands in one bound taking their losses over 50%. Or so we thought. For command dice we rolled ones far too often; much to Graham’s chagrin. However the enhanced size of the inert commands provided enormous staying power especially if you use the correct list to calculate the percentage losses. To my horror, during lunch I realised that I’d used the break points from a 400 point list I’d used the week before. 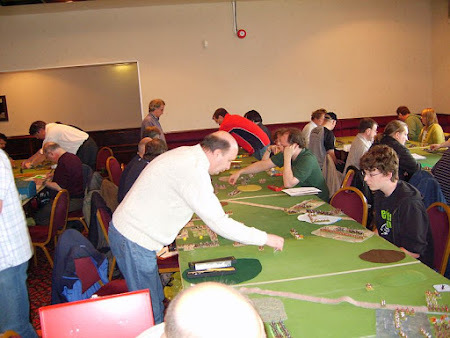 We could have played on if I’d used the correct 450 point list. Doh! 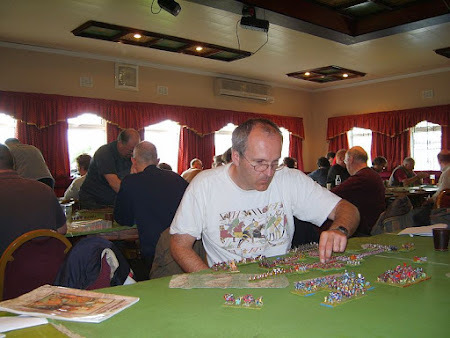 After lunch we played Thomas Fox who fielded Later Imperial (Western) Romans. After a hard struggle we won 17-15. Again the inert Poles rolled an excessive amount of 1s for PIP dice. As a result we regularly failed to move two of our four commands. At the end however both armies were broken having lost more than 50% of their morale equivalents. We got the extra points only because we were defending. Thomas was a great opponent and introduced us to a couple of rules we’d not come across before. So I ended the day less Befuddled than I started: result! Inert irregular armies can be a slow and very frustrating to use. Poor PIP dice can completely cripple the army. A really simple plan is vital – it cannot be too basic. A great deal of patience is required. The larger inert army can be used to wear down opponents. This shows that the inert concept in DBMM works. However, being inert significantly amplifies the effect of the Irregular command penalty which takes some handling. Sadly, the Later Poles with an Inert C-in-C is not a good doubles army for Graham & I and I doubt we’ll use it again. Talking to Graham on the way home he said he found it hard to play with the army as it frustrated his style of play. Graham prefers setting up high probability attacks before moving in for the kill in the next bound. The lack of PIPs meant this didn’t happen often enough. In fact we seldom rolled an average score on four dice (14 ± 2) two bounds in a row. I think we’ll have to have a couple of pints and think this through. When I got home and checked my camera I saw that, during the first game, I’d taken a picture of Thomas’ first game. If only I’d checked the camera at lunch time I’d have had a preview of how Thomas was likely to deploy. Bugger! This photo also continues a tradition in which every “On Tour” post contains a photo of Bill “Kilroy” Skinner. Chatting to Bill I understand that his son has sent links to many of Bill’s family. I hope they all enjoy the latest addition to their family album.